Paul Stanley, Guy Mann Dude, Richard T. Bear and Brad Parker. Produced by Desmond Child. Recorded and Mixed by Sir Arthur Poyson. Recorded at Bearsville Studios, New York / Kampo Studio, NYC, New York. Mixed at Conway Studios, Hollywood, California. Track 05 : Recorded at Media Sound, NYC, New York / Right Track, NYC, New York. Track 10 : Produced by Gavin Spencer. Remixed by Bill Schenimon. Recorded at Sidepocket Sound, NYC, New York. 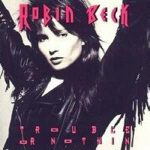 To celebrate the 20th Anniversary of Trouble Or Nothing, Robin Beck released a brand new re-recording of the whole album, January 2009. "Trouble Or Nothing - 20th Anniversary Edition" is repackaged with a new take on the original artwork and re-recorded with other musicians using the latest techniques for pristine audio quality with brand new vocals by Robin Beck and produced by James Christian (House Of Lords). Also four never before recorded songs are included on the 2009 version of the CD. Except for songwriter credits for "Hide Your Heart", Paul Stanley is not involved as a musician/ backing singer on the "20th Anniversary Edition of the disc.